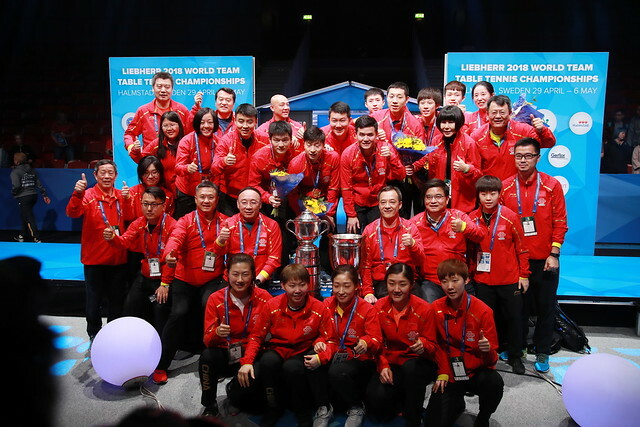 The teams that will contest the knockout phase of the Liebherr 2018 World Team Table Tennis Championships have been determined and we are a step closer to finding out who will be the best table tennis team on earth here in Halmstad, Sweden. After three days of intense battle in the round robin phase, China, Japan and Korea Republic all secured all five victories to top their respective Groups (A, B & D) to qualify directly to the quarter-finals. Romania was able to come in first in Group C, but not without difficulties. The European Champions who had lost to Netherlands earlier on the first day due to their coach Viorel FILIMON being late for the coin toss, resulting in the team having to play with their default team according to alphabetical order. This meant their top two players Bernadette SZOCS and Elizabeta SAMARA had to miss out on the action and Romania eventually lost 1-3 to Netherlands. Determined to finish first in the group to advance directly to the quarter-finals, a pumped up Romanian trio of SZOCS, SAMARA and Daniela DODEAN MONTEIRO were in top form to secure both victories today against third seed Chinese Taipei 3-0 and the talented DPR Korea 3-1 against all the odds. The final round of the Men’s Team group stage will be played tomorrow, 2 May 2018, to determine the final standings in each group and the top 12 teams who will make it to the Men’s Team main draw. Top seeded Germany, China and Korea Republic, as well as England who caused one of the biggest upsets in World Championships history beating Japan, remained unbeaten to guarantee they all finish first in their group and have a direct passage to the quarter-finals. 11 teams are still in the running for the 8 spots that play off for the quarter-final positions, so all is to play for tomorrow. The 72 teams here in Halmstad are split into three divisions, with the top 24 teams in the Championship Division battling to become World Champion. The first stage of the event consists of the 24 teams being split into four groups of six teams. The top two team in the group progresses straight the quarter-finals, while the second and third placed team having to play a knockout in the last 16 to make their way into the quarter-finals.